Apple is ready to bust out a range of new iMac models with better displays and CPU components under the shiny hood. First reported by Trusted Reviews, trusted KGI Securities analyst Ming-Chi Kuo predicted that souped up iMacs will be on the way in the third quarter of 2015 and rumors are rife it could be the first 21-inch Retina model. 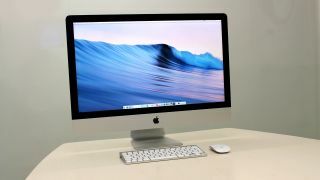 Kuo stated that the iMacs will have "key selling points such as more powerful processors and much better display quality." The screen will use an LED phosphor material called KSF that will "notably boost colour saturation." The hope is that this will allow Apple to finally bring a Retina model with a 21-inch to the range alongside the 27-inch models that have been out for some time. When it comes to CPUs, the new iMac will also get an uplift in the shape of new Intel Broadwell processors that are now available. Apple last updated its iMac range when it introduced the iMac with a 5K Retina display towards the end of 2014 and the 5,210 x 2,800 pixel resolution that is four times that of the regular 27-inch iMac achieved an almost perfect 4.5 out of 5 stars in TechRadar's review.